Baylor Institute for Studies of Religion (ISR): Surveys of Religion : Некоммерческая Исследовательская Служба "Среда"
Most survey studies that include questions about religion only have space to ask about basic religious indicators such as church attendance and belief in God. This is understandable, as most surveys are focused on other topics such as crime or politics and space is at a premium. ISR received a major three-year grant from the John M. Templeton Foundation, to conduct a nationally representative multi-year study of religious values, practices, and behaviors. 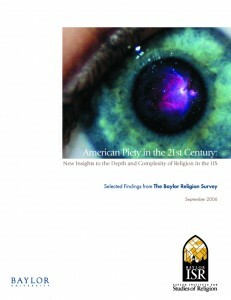 After several years devoted to development and pretesting by Baylor faculty, the Baylor Survey of Religion (BSR) was fielded during the winter of 2005 and the data was made available for analysis in the spring of 2006. A second wave was fielded during the fall of 2007 and the data was made available in 2008. The Baylor Religion Survey is the most extensive and sensitive study of religion ever conducted, linking up with the pioneering surveys conducted by Rodney Stark and Charles Y. Glock in the 1960s. With the Baylor Religion Survey, we were able to dig deeper into American religious attitudes, behaviors and beliefs than previously possible. The field work was completed by the Gallup Organization. It plumbs all facets of American religion and spirituality in depth – nearly 400 items cover such matters as religious beliefs and practices, including religious consumerism, as well as nonstandard beliefs (astrology, “Bigfoot,” alien visitors, etc.) and practices (meditation, New Age therapies, etc). Utilizing a mixed-mode sampling design (telephone and self-administered mailed surveys), the Baylor Religion Survey is a nationally representative survey of 1,721 respondents and is merely the first two waves of a rich and rewarding new era of religious survey research. Additional waves of the Baylor Religion Survey, with rotating topical modules, will take place every other year. The hundreds of in-depth religion questions included on the Baylor Surveys of Religion has produced many findings. Indeed, over two dozen different studies have been published. Preliminary findings related to the measurement of religion, the nature of religious belief, the relationship between religion and moral and political attitudes, and religious spending habits were released in Wave 1 at the National Press Club on September 11, 2006, in a research report entitled American Piety in the 21st Century: New Insights to the Depths and Complexity of Religion in the U.S. 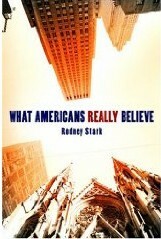 In the follow-up to the landmark 2005 survey that revealed a majority of Americans believe in God or a higher power, the new Baylor findings released in Wave 2 – published in What Americans Really Believe by Dr. Rodney Stark (Baylor University Press, 2008) – highlight even more hot-button issues of religious life in America. In releasing their findings at a news conference in the nation’s capital on September 18, 2008, the authors of the Baylor Religion Survey – Dr. Rodney Stark, Dr. Byron Johnson, Dr. Christopher Bader and Dr. Carson Mencken – said their work offers a different perspective on the depth and complexity of America’s religious landscape. A total of 1,648 adults chosen randomly from across the country answered more than 350 items in the survey, which was designed by the Baylor Institute for Studies of Religion (ISR) and conducted by the Gallup organization in the fall of 2007. The Next Wave The Baylor Religion Survey is funded by the John M. Templeton Foundation, and will be repeated every two years. Additional reports will be released in the coming months as the researchers delve further into the data they collected. A grant in the amount of $1,730,000 from the John M. Templeton Foundation was awarded to the Institute for Studies of Religion in May 2006 to conduct the first series of nationwide empirical studies on values in China. Probably the most significant current religious development in the world is the very rapid growth of Christianity in China. In 1949, the Marxists came to power and expelled all foreign missionaries. At that time, there were an estimated 2 million Christians in China. Now, after decades of repression, a renewed Chinese Christianity has burst forth and their numbers are variously estimated at 50 to 120 million, and growing. The Islamic Social Attitudes Survey Project (ISAS) is a comparative study on Islamic Religiosity and Social Attitudes among college students in majority-Muslim countries. The religiosity components are designed to probe issues of religious practice, belief, behavior, belonging, religious networks, spiritual experience, and family religiosity. Social Attitude modules include women’s rights, minority rights, democracy, and relations with the West.